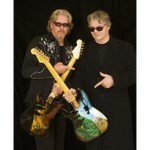 Steve Miller is selling two autographed, custom-painted guitars to benefit the firefighters who battled a forest blaze near his Sun Valley, Idaho-area home this summer. The one-of-a-kind axes, which Miller played during a Nov. 17 concert, currently are listed online for $32,000 each. They will go up for auction Dec. 25 if those prices are not met. Thanks for the useful info! I would not have gotten this by myself!